Some 25 people showed up to a protest outside Amilcar Perez-Lopez’s old house. The protest was scheduled during an open house for a unit in the building that was listed on Craigslist. Photo by Joe Rivano Barros. 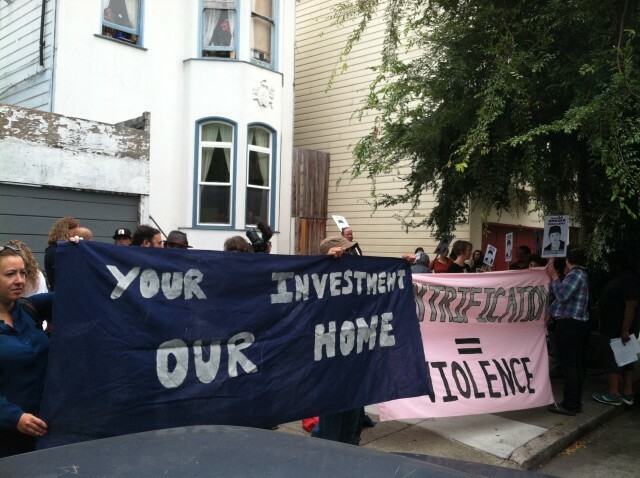 A hastily assembled group of 25 people gathered outside of 2348 Folsom St. at noon today to protest the open house of a unit in the building where Amilcar Perez-Lopez lived. Perez-Lopez was shot and killed by police in February, and protesters called attention to the link between gentrification and police violence. The high-cost of the unit – the lease was listed at $4,295 with parking offered for an additional $300 monthly – caused many to associate the event with displacement and gentrification. However, no one there knew why the tenants left the rental unit or even if the unit being offered was the same one where Perez-Lopez and two roommates lived. At the time of the shooting, Perez-Lopez and his roommates were in the process of being evicted, though it is unclear under what grounds. Florencia Rojo, another neighbor and the main organizer of the event, said on Facebook that the tenants had gone to court to avoid eviction and that one had taken a buy-out. No one at the protest, however, could confirm the details. Schiff added that the tenants were traumatized by the shooting of Perez-Lopez and that the unit was “flipped while under a time of great stress” for them. The shooting of 21-year-old Perez-Lopez sparked outrage because of conflicting accounts between witnesses and the police, police claiming he lunged at a plainclothes officer with a knife while some witnesses said he had dropped the knife and was running away. An independent autopsy found Perez-Lopez had been shot six times, four in the back and once each in the head and right arm. A lawyer for the family has filed a lawsuit pressing charges against San Francisco, the police department, Police Chief Greg Suhr, and the two officers involved. 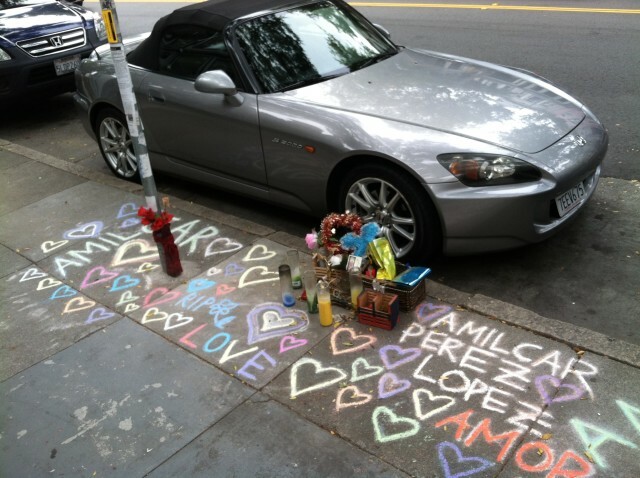 A memorial for Amilcar Perez-Lopez located where he was killed by police, just steps from his old house. Photo by Joe Rivano Barros. Aaron Zambrano, who put up the Craigslist posting, said he wasn’t the building’s owner and that he had “no idea” whether the unit being offered was the one where Perez-Lopez lived. Schiff said the specifics didn’t matter and that the larger issue was how gentrification was contributing to police violence. “The person that called the cops [on Perez-Lopez] was someone else [not involved in the situation] who called because he looked suspicious,” Schiff said. She added that new residents call the police more often on “suspicious-looking” people and referenced the Alex Nieto case. Nieto was killed by police after someone mistook his taser for a gun and called the cops. Rojo called for the action after noticing a Craigslist ad for Perez-Lopez’s apartment building and posting it to the “Justice 4 Amilcar” Facebook group on Friday. Rojo then created an event to coincide with the unit’s scheduled open house. Two people had come to the apartment around 11:45 a.m. for the open house, but they left well before the main crowd formed. During the protest, no one came for the open house. Organizers marked that as a victory. Correction: An earlier version of this article attributed the quote “We know they [the tenants] were originally fighting [the eviction]” to Carrie Schiff. It was said by Fred Sherburn-Zimmer and has been updated. NextGood Morning Mission to the Same but Different!